Taikoza believes in bringing high-quality performances to the students and introducing them to a new culture in a fun and entertaining way. Multicultural programs allow children to come into direct contact with a new culture and can help open their minds to the world and further their knowledge and growth. Roughly translated, Taiko means “big drums”—and that’s exactly what Taikoza brings. Big drums, powerful rhythms, and electrifying, room-thumping energy. 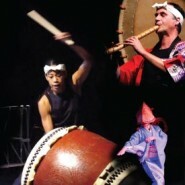 Taikoza ‘s music draws from Japan’s rich tradition of performance to create a highly visual performance. With colorful traditional costumes and dynamic motion, Taikoza’s shows are immensely popular with audiences of all ages. Taikoza was formed in New York City by members of Ondekoza (the group that started the renaissance of Taiko in Japan in the 1960s and introduced Taiko to the world). 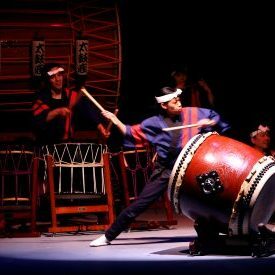 The members of Taikoza have performed in some of the most prestigious halls and locations in the world, including Carnegie Hall, Boston Symphony Hall, Suntory Hall, Moscow’s Tchaikovsky Hall and House of Music, Osaka Festival Hall, Lincoln Center, Mount Fuji, Miyajima Temple in Hiroshima, Peace Memorial Hall in Hiroshima, and many others. They have performed in Russia, Italy, Brazil, Argentina, Switzerland, Germany, France, Mexico, Belarus, the Republic of Georgia, and many other locations, and appeared on ESPN, NBC, and The History Channel. Taikoza’s music is featured on the Nintendo’s Wii games Red Steel 1 and 2, and they have performed for the SUMO tournament at Madison Square Garden.